Lakes freeze from the top down, most of that stuff sinks to the bottom. It's not like modern ice cube trays where it's cold on all sides and impurities are surrounded by crystal formation. So I'd say it's no more full of dead bugs and silt than any other aspect of ancient/medieval life. (When you're chipping off a bit for your drink, discard the chunk with the bug in it! ) I will admit that the operation I had in mind when I posted was geared more toward providing ice blocks to keep other foods refrigerated than for direct consumption. I don't know how much was actually used in cold drinks. But, personally, lake ice would not be at the top of my list of sanitary concerns were I suddenly sent back in time. Heck, it probably has fewer issues than drinking from the same lake in the summer. I was just pointing out that it wasn't quite a simple as was made out. The idea that ancient/medieval people routinely drank dirty water is a historical myth. No, because impurities tend to sink to the bottom, the reason that it is occasionally possible to find drinkable water in the DF caverns. If you skim water off the top of a lake, most of the impurities won't be in it. But if you are talking about having ice without refrigeration, you are going for as big a chunk of ice as possible, which means you aren't just skimming the top of the lake as you would be if you were drinking it normally. Granted none of these things matter if you are using it for purposes of cooling stuff down but it is an issue if you intend to actually consume it. If you're in a climate with snow, you'd probably freeze your own drinking ice. If not, you'd take it from a frozen body of water and transport it somehow. There won't be silt or bugs in it unless you're digging really deep into the lake, and no one would ever do that as the surface ice would vastly exceed demand in any significant body of water. Look up "zone melting" if you're still not convinced. Letting nature do that for you is much better than trying to emulate the process yourself. Edit: In DF collecting snow would be useful as it would provide a source of water in cold biomes and could help set up an ice industry if you don't have surface water. There are more dwafy ways of creating ice. I didn't mean to imply that drinking supplies would be unusually dirty, only trying to emphasize that the ice supply would be no dirtier. And skimming the top of the lake is exactly what you do: the ice layer insulates the remaining water from the freezing air; lakes even far north of where I live never freeze to the bottom. You seem to have in mind a scenario where you're trying to haul one ginormous chunk of ice, and that isn't particularly desirable even were it feasible. Although, being the DF suggestions forum, I will grant that it sounds quite dwarfy to do it that way, supposing you have dwarfy mechanisms to call upon. It's easier (for humans) to handle when the volume is made up of many, many conveniently sized 'bricks.' I'm not certain of the ideal thickness but I'd estimate it's in the 15-25 cm range; ~10 cm is considered minimum to support a person safely but I'm bringing a vehicle for hauling as well. Once the lake ice can support the load, use an augur for a starting hole(s) and then a hand saw to cut out regular pieces. Then pick up the bricks with tongs (handling directly makes frostbite even more likely in this cold job) and stack them in the sled or wagon. Accumulate these from across the surface of any decent sized lake and you'll have plenty of ice. Furthermore if your lake is spring-fed or, like mine, river-fed then it's quite possible that your water source does not freeze, meaning that the water level in the lake is replenished as the ice is removed. The freeze cycle starts anew for even more ice; there is never any reason to visit the mucky, unfrozen bottom. Never have I before wished to reference the film Frozen as an exemplar. In this case, how a workforce might extract ice. Noting that none of those numbers on Wikipedia are "Let It Go", "Do You Want To Build A Snowman" or "Reindeers Are Better Than People", unlike Frozen. You want an enormous chunk of ice because that keeps it from melting so easily. A lot of small pieces of ice melts a lot faster than a single chunk of ice. The top melts first however, which means the clean ice gets lost faster than the dirty ice at the middle of the chunk. In game mechanical terms, what this needs is to keep track of the mud content of water when it freezes, I think at the moment freezing water purified it just as pumps do. You want an enormous chunk of ice because that keeps it from melting so easily. A lot of small pieces of ice melts a lot faster than a single chunk of ice. I'm saying you can build a large mass more easily than moving one whole, and thus store the same amount of potential energy. The top melts first however, which means the clean ice gets lost faster than the dirty ice at the middle of the chunk. None of my ice is from any deeper than a bucket barely dipped under the surface. If you were satisfied that surface water is clean enough for making tea then you can rest assured the ice I'm supplying is likewise clean enough for chilling tea. Any decent quality ice, though, will make visible any obvious contamination, and the ice-vendor will account for it. Just as they account for the straw/whatever insulation they pack around the block. After transporting as large a block as they can extract from the source and package up for transport (a 10cm-cube will weigh slightly under a kilogramme and last a certain amount of time without significant loss, a metre-sided cube (or 1000 of the prior cubes repacked together as one) would weigh slightly less than a tonne and last maybe 10 times as long to a similar degree - so choose the scale you can best work with given your capabilities) it is trivial enough to saw/shave/plane off any bits you don't like the look of. You can even slice the large block up through any internal impure intrusions, sluice away the undesirable contamination and then repack the ice, now clean. It might even reseal itself, as the liquid melt between two ice-bodies could freeze-weld it all together, though aesthetic/structural flaws might not be entirely conducive to the ice-sculpture industry, without special care. Given everything else that can go wrong with water, I'd probably trust the freeze-distilled water of 'wild-sourced ice' more than the unfrozen version of the same source of water, under most circumstances. Please give the dimensions for"enormous", and a mass estimate, and an explanation for how it could either be deep enough to be"dirty" or feasible to carry. I was of the understanding we were just taking our ice from a lake there. If we crush snow together we can indeed create a mass, but multiple blocks of solid ice are pretty hard to combine. You really want to carry the largest block of ice you can. The bigger the ice block, the less of it melts relatively speaking before you get it where you want it to be. There is of course a bonus if you are carrying it through less that 0 C temperatures, but underground at any depth things will melt fast, even if it's freezing up there. 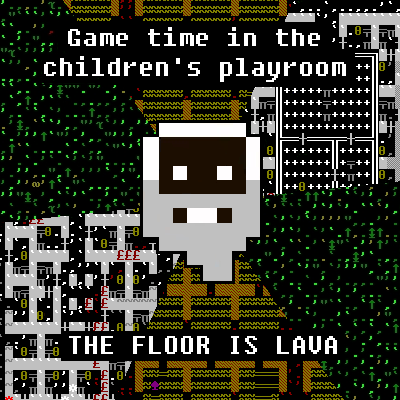 I think you are ignoring my argument that you won't always be playing dorfs. Yes, races and civs will be procgen. But dwarves, being a common fantasy race, will likely be present in many worlds. I'm just saying that there is no point in not adding tea just because dwarves would not drink it. So... I agree that other drinks would be a fine addition to DF and that other races might enjoy tea. My point was that dwarfs (as they are defined in the DF raws) are unlikely to develop "tea ceremonies". There is nothing indicating that dwarfs, humans, and the others are capable of eating all of the same things. This is important. Maybe 75% of the known plants are toxic in some way to humans and some might not be toxic to dwarfs, or caffeine may have no effect on dwarfs. Look at what aspirin does to cats and chocolate to dogs. There is nothing indicating that dwarfs, humans, and the others are capable of eating all of the same things. This is important. Maybe 75% of the known plants are toxic in some way to humans and some might not be toxic to dwarfs, or caffeine may have no effect on dwarfs. It's quite plausible that dwarves' iron livers would allow them to safely ingest certain toxins that would kill a human (and possibly vice versa), so that's a fun bit of difference . . . but I believe that interspecies hybrids are planned, meaning that any toxicity differences will also have to consider things like half-dwarves. An idea that I had earlier in this thread would be to make both caffeine and alcohol affect dwarves in the exact opposite manner that they do to humans (inebriated dwarves already do their work much faster than sober ones, etc. ), but having to take half-dwarves into account pretty much killed that possible suggestion. It's a differently-shifted/skewed normal distribution. Human works well enough with no drink, a tot of rum might help fortify them slightly but a few more tots and they're Dungeoneering Under the Influence. A dwarf has a scale that is almost up against "the maximum alcohol anyone could physically drink" (a limit like "you can't drinking negative amounts" that windows the otherwise function without spoiling the theoretical curve) and deteriorates as you head towards nothing.